Bodybuilding Roundtable: How The Pros Develop Their Arms. Find out what the pros do about arm training. Here they give their two cents worth and then some about proper technique, methods, and stress the importance of not overtraining. Building arms that are both massive and defined is something every beginning bodybuilder aspires to. Indeed, it is often said that the arms possess a special type of allure, as they are the most obvious muscle group, and a most impressive one at that. Thick biceps, triceps and forearms simply hanging at ones side convey an impression of strength. Flexed, they take on a life of their own and become a truly spectacular sight. Let&apos;s face it; big arms leave a lasting impression. Although a symmetrical physique with no outstanding body-parts is probably the ideal in today&apos;s ultra competitive world of pro bodybuilding, massive arms have a special appeal, perhaps making them the exception to this particular rule. In short, impressive arms are where it&apos;s at when it comes to developing an impressive physique. But exactly how does one build to the extreme these sought-after commodities of muscle? What are the best training splits? Are there any secrets to developing big guns? Rather than disclose my own theories on arm training, and given the importance of developing this grouping of muscles, I present the following discussion. In order to gain an informed understanding of particular topic, it is often important to get a number of differing perspectives. When it comes to arm training, it seems everyone has a theory or two up their sleeve. For the purposes of this article, and in the interests of ensuring the best advice possible, I have picked the brains of four of the best pro bodybuilders in the world, all of whom are renowned for their superior arm development. Dave won his first show, The Mr. New Jersey, in 1963, after a childhood love affair with the iron. He went on to win the 1965 Mr. America and 1966 Mr. Universe titles and became classed as one of the greatest of golden era bodybuilders, due to his amazing physique and commitment to the sport. Now in his sixties, Dave still trains regularly and shares his vast knowledge base with his many fans via an online forum and e-mail service. Dave was known for his total arm development. These were huge, perfectly shaped, biceps, triceps and forearms. 58-year-old Bill Grant is another who is regarded as a bodybuilding legend. With over 40 years of professional experience in the bodybuilding and fitness industry, qualifying him as a true insider, Bill is in demand as both a speaker and trainer. 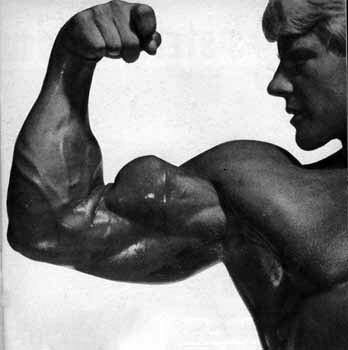 Back in 72 and 74 Bill respectively won the Mr. America and Mr. World titles. Today, he continues to stay in great shape while running his own nutritional company, Bill Grant Nutrition. Bill&apos;s arms were, and are, particularly noteworthy. 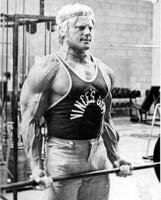 Dave began weight-training in 1979, at the age of 16, and has since been a major player in the fitness industry. In 1985, Dave won the light-heavyweight and overall at the NPC Mr. USA, thus gaining his pro card. An Interview With Pro Bodybuilder Dave Hawk. In the following interview, Dave gives an excellent overview of his life in bodybuilding and provides valuable commentary on the finer points of muscle-building. He has been training, and competing ever since - the most recent outing being the 2003 Masters Olympia, where he took a respectable 4th. Although Dave is known for his conditioning and symmetry, his arms are both massive and balanced. Jeff began weight-training at the age of sixteen, and, to secure his pro card, captured the light-heavyweight and overall at the Team Universe championships in 2003. He currently owns Jeff Willet&apos;s Powerhouse Gym which is based in his home town of Adrian, Michigan, and is a proponent of the Max-OT training principals. An Interview With Natural IFBB Pro Jeff Willet! I&apos;ve accomplished my primary goal of becoming an IFBB Pro. Now my focus has turned to running a gym, keeping in shape, and other areas in the bodybuilding arena! Jeff&apos;s physique could be described as "mass with class" as it is very balanced. His arms, although not out of balance with the rest of his physique, are particularly impressive. And How Often Per Week Should One Train Their Arms? There are many different variables to take into account when aiming to develop massive arms. The training spilt could possibly be the most important of these, in that despite the amount of weight lifted and number of reps prescribed, training too frequently, or infrequently, and/or structuring sessions incorrectly, could lead to a failure to attain results, or even hasten regression. The following are split&apos;s the featured pros use, and recommend, for advanced lifters. Dave Hawk personally achieves the best results when he trains biceps two times the first and third week with (high volume reps, small number of sets and exercises) and only once the second and forth week. With this split he only trains triceps and forearms one time per week using the same principles. "On the first workout, I train triceps first, followed by biceps and then forearms. The following workout I do biceps first followed by triceps and forearms." Jeff places less emphasis on the actual training split itself, and more on other aspects of the session. "The split is not as important to me as the sets, reps, exercise selection and frequency. I train all body parts once a week." As exemplified by the following, Jeff prefers to keep things simple, and this has obviously worked for him. "I currently train biceps with back, and triceps with chest. I often change my routine after every 8-10 weeks so the split may vary." His exercise selection varies. Bill trains his arms at least twice a week using a superset routine. "I work biceps and triceps together in a superset fashion. Doing a bicep/triceps combination. Sometimes I will do four different exercises in a superset fashion doing a bicep, triceps, bicep and triceps exercise all one right after another to get the maximum amount of work in the shortest period of time and getting a super pump in the process. I credit this type of arm training for my arm size." Also a fan of super-setting is Dave Draper. "I superset biceps and triceps: that is, I do a set of bis followed by a set of tris. I do the same when targeting forearms; forearms followed by bis, then tris. "I train arms once a week, specifically, and twice more when considering the overload they endure during certain pulling movements for back and pressing for shoulders and arms." Having been given a good breakdown of how the pros structure their sessions, we now turn to the spotlight on the types of training principals they use. Exactly what do these champions do to develop their arms to world class standards? The following will shed some light. Click Here For A Printable Log Of Jeff Willet&apos;s Arm Routine. "I believe in a low number of total sets for arms, and feel they should be worked only once per week. This is consistent with the Max-OT philosophy in that recovery is a key element in the muscle growth equation. "Also, I use basic free weight movements with heavy weight and low reps. I stay in a four to six rep range on most of my movements. If I can get more than 6 reps, the weight is probably too light." Bills training approach consists of both super-setting and high volume. "My current arm training consists of two bicep exercises and two triceps exercises done in a superset fashion. I do hammer strength curls super-setted with triceps press downs. "The second set is barbell curls super-setted with overhead triceps extensions. I usually do three sets of 12 to 15 reps on each one. I like high volume training. I think this is the most effective for muscular growth. "I do forearms in the same fashion as biceps. I superset two different exercises for this body part. I do three sets of wrist curls seated on a flat bench. I then superset with wrist roller curls. If we send people to the sight where I have my massive arm training video everyone will get a good idea of how this workout is done." 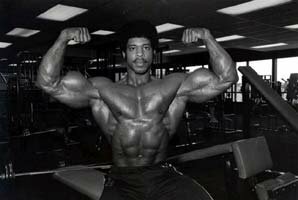 Bill Grant&apos;s Old-School Bodybuilding Series: The Secret To Massive Arms! If you don&apos;t know legendary bodybuilder Bill Grant you should. In this article I will give a brief overview of his career and include a webcast video with him performing an arm workout. Check it out! With his arm workouts, Dave prefers to pick from a list of exercises, and the type of exercises he uses varies from session to session. Seated dumbbell alternate curl (5 x 10, 8, 6 reps) - Ex - Shown Standing. "I train arms once a week, and approach near max-rep intensity without compromising decent form or threatening nasty injury." "Also, I use 1 1/2" thick bars or handles where and when I can for more resistance and groove control, hand comfort and ease of wrist and elbow pain from certain repetitive movements. Thick-bar physics and mechanics account for interesting advantages in one&apos;s training." The Most Effective Strategies For Beginners. The routines discussed above are all excellent alternatives for the advanced lifter, but what about the beginner? When beginning any program, there are certain basic requirements that must be fulfilled, if appreciable results are to be obtained. Before tackling the above techniques, a good foundation is needed. Dave Draper has a wealth of experience, and his advice as it pertains to the beginner is of immense value. In fact, the advice Dave gives here still applies to his current training regime, and although he is famous for developing special training techniques, Dave relies to a large extent on the tried and tested basic movements. "Once you are conditioned and prepared physically, do standing barbell curls and dips with all your might. 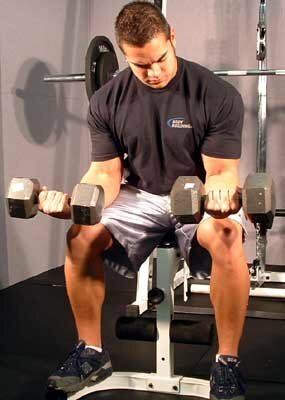 Don&apos;t cheat, but don&apos;t perform the curls with perfect isolated form either (reminds me of those kids who sit in the front row at school... they get straight A&apos;s, but don&apos;t learn a thing). A healthy thrust is good for you; allows you to legitimately employ a heavier load, engages the upper body more completely and efficiently for systemic muscle growth, and is more interesting and challenging and demanding, which prepares you for future training devotion. "Dips get the tris, but they wrap the associated arm muscles in a strong shoulder, chest and upper back package. Dips are a fun and functional and practical movement and machine dips for beginners are terrific. "Too often beginners fail to stick to a standard regimen and don&apos;t get the overload that comes through repetition and overcoming. These two basics have been in my regular training since gasoline was 29.9 a gallon. Fill&apos;er up, bub." Jeff also agrees that beginners should stick to the basic compound movements while working to develop excellent technique from day one. "Stick to the basic compound free weight exercises and keep the total set volume low. Oftentimes beginners do too many sets and reps for all body parts and particularly arms. I recommend training arms once a week." Bill believes the best way for a beginner to build big arms is to stick with the basics right from the start, for about six to seven months. A good foundation is imperative, he feels. "For example, barbell curls and some triceps extensions are good, but remember as a beginner a good leg program is very important because that will help you gain overall body weight that means even in your arms. That may sound strange but I could talk about this for quit a while, but that would have to be an entirely different subject. Building a good foundation is the key to any good physique. As you get more advanced than you can start employing some of the techniques that I have described above." Dave Hawk currently helps to train his son, David, who is an impressive up and coming bodybuilding champ. Remember, it takes years of dedication and discipline to build arms like Arnold&apos;s or Flex Wheeler&apos;s.
It&apos;s important to use a variety of exercises, using free weights, barbells, dumbbells, cables and machines. Don&apos;t over-train your arms. There is a tendency for guys wanting to build bigger arms to almost always over-train. Set your schedule (set, reps and weight) and do it the way you have planned; don&apos;t feel you always need a few extra sets, or that you have to totally blow out your arms to get results. Flex and stretch the muscles vs. heavy-heavy weight - When training arms it is even more important to have good form. If you can&apos;t control the movement by flexing or contracting and then stretching the muscles fully, then you&apos;re using too much weight for the exercise. Get your dietary requirements in consistently (protein, carbs, fats and appropriate calories) and get plenty of rest. On Using Special Training Techniques To Build The Arms? Avoid doing training a certain way year round because eventually it can, and will, lead to overtraining. Try this workout (featured earlier in this article) for six weeks to stimulate growth and improve mind muscle contraction, then try something different for both biceps and triceps. Remember, the key to building any muscle is to concentrate on the feel of the triceps and biceps movement, a complete contraction (squeeze) at the top of the movement and a full stretch at the end. Without this your results will be sub optimal. Never go so heavy; this will cause you to use muscles (like delts etc) that you&apos;re not supposed to use during these exercises. Work each set to failure until you can no longer complete a repetition with good form. Always go for a good muscle burn and pump first! Use a variety of exercises each week. Using either dumbbells, barbell, cables or machines and working any of these movements from either seated or standing or lying position providing you with a different feel to the muscular contraction and stretch. 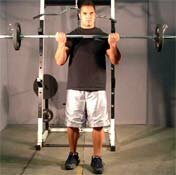 "All of us here who have put our time and heart and soul into muscle-building come up with a few favorite exercises that seem to bear our stamp of uniqueness; a basic movement with a little modification of groove or angle or application. "These are often discovered out of the tedium of sameness, one&apos;s sensitivity and creative inventiveness or through injury and limitations associated with pain or range of motion. The latter has been my greatest teacher. "Nothing beats the standing barbell curl for big arm development. That and the doers doing does it. Dave Draper Performing A Standing Barbell Curl. "However, I like low-incline dumbbell curls (a flat bench raised at one end by a 15" block). Lie flat, feet up on bench and allow light-to-moderate weight dumbbells to hang fully aside the bench, palms in a forward position. "Pull steadily and dynamically upward to a comfortable, sensible rep-completed position - contract, lower deliberately to a fully extended position, hyper-pause and do it again. Sets of 10 working down to six as you increase the weight is very cool for the entire biceps, top to bottom, and puts a nice load on related upper body muscles. "This movement brings you physically close to the biceps and their exertion making your straining more palpable and intimate. It allows you to do bis when certain shoulder or back afflictions render arm work impossible or limited. Feels great once you get over the stretching oddness; a new sense of development registers." Bill doesn&apos;t have any unique movements per se, as he tends to support the basic, no frills, approach. Good old super-sets do it for Bill. "As far as any special arm training techniques, it is simple, as I can see super-sets are the best and most efficient way to build big arms. Lets look at all the champions with big arms. i.e. : Arnold, Robby. Lou, Larry Scott etc. They all did super-sets." Jeff similarly doesn&apos;t make habit of using special movements. He prefers his tried and true Max-OT principals. "Max-OT is the most effective technique for building muscle from head to toe, and this includes the arms." The advice given in this article will undoubtedly benefit anyone wanting to improve their arm development. Indeed, the information presented here has stood the test of time, and has come directly from some of the greatest minds in bodybuilding. However, building big arms (and in particular improving their shape and level of definition) is also dependant on a sizable genetic component. All the champions featured in this article have great genetics for bodybuilding, and this has enabled them to develop their arms to the point where they are now classed as authorities on training this impressive muscle group. The point here is that, although the arms can be improved with consistent effort and the right knowledge base (which this article will help to provide), they are limited to a large extend by virtue of ones genetics. Often the best approach for those wanting to build large arms, but who lack the genetic potential to reach the Dave Hawk level for example, is to focus exclusively on the basics, get plenty of rest, address their nutritional requirements, and train consistently. To Dave Hawk, genetics play a crucial rule in terms of developing muscle size and shape for the arms. "When I was younger I wanted and needed bigger biceps. I read almost every pro&apos;s arm workout and realized they each had slightly different routines. What I learned from this, what worked for Arnold&apos;s or Lou&apos;s biceps, didn&apos;t necessarily work for mine. I was lucky though, my triceps had much better genetics and responded well and took a little less effort in finding what worked. When training for size there is no one program that fits all arms, chest, legs and etc." Jeff considers himself to be blessed in the arms department, and it shows. "My arms as a whole have always responded well to training and have been my strongest body part from the beginning." Dave Draper feels both his biceps and triceps have met their genetic maximum, at an even rate of growth. He underscores the importance of consistent, hard work. "None of the development came without grueling persistence and great investment. The bis had a better blueprint than the tris." Bill is another who feels his arms in general, and biceps in particular, are particularly receptive, and genetically suited, to hard training. "My biceps seem to grow a little faster than my triceps. As far as my arms are concerned I would have to say with out a doubt that my arms are the easiest to grow. It has been that way ever since I started lifting weights." In light of what has been discussed in this article, it would be worth addressing any universal concepts that have emerged. Indeed, it seems there are certain tried and tested principals that can be applied to virtually anyone&apos;s program, that will almost guarantee results. Although the featured pros have discovered their own unique methods for building arms, they continue to implement similar strategies; ideas that seem to work well for them all. The following arm training ideas could be said to have stood the test of time, and should assist the hardest of hard-gainers. Supersets have proven very popular, both at the pro level, and with the general bodybuilding population. The idea with supersets is to get as much blood as possible into designated complex of muscles, with the end goal being maximal muscular failure. Performing a set of standing biceps curls and immediately following this a set of triceps press-downs constitutes one superset. This is an intensity technique that never fails to stimulate a particular grouping of muscles to the limit. Do you need a routine to add some serious slabs of mass to your body? If you do then this is the plan to trick your body into some super gains! Vary The Number Of Exercises, Sets & Reps. They say variety is the spice of life. In bodybuilding, this maxim stands true. Varying the number sets and reps, keeps the muscle guessing, as they say. This helps when it comes to stimulating new growth - the muscles have to continually adapt to a new stimulus, and thus continue to find new ways of growing. One idea is to have a long list of arm exercises from which to choose, say three or four, per workout. Selecting exercises at random - for example picking from a box a certain number of exercises on paper, without looking - is another way of mixing things up for continued gains. Dropping, or increasing, the rep range on occasion, and/or manipulating the number of sets, will also help in this regard. Make The Basic Exercises The Core Of Your Routine. Arms exercise such as the standing bicep curl, standing triceps press-down, and seated forearm curl, remain the cornerstone of many bodybuilders routines, and for good reason - they work. Additional movements (whether they be finishing movements such as triceps kickbacks or isolating movements like preacher curls) definitely have their place, but the basics will always be the basics, and these are responsible for packing more mass on the arms than any other exercises. Incidentally, movements like squats and bench presses (the key basic compound-type exercises) actually stimulate the entire body, making them essential for maximal arm development also. Don&apos;t Train Arms Too Often. All pulling and pushing movements (which means almost every upper-body exercise in existence) target the arms to some degree. Thus, they should be taken into account when planning specific biceps, triceps and forearms training sessions. Most pros recommend training the arms once a week, due to the secondary stimulation they receive when chest, back and shoulders are trained. Training the arms too often is likely to lead to over-training, and this will curtain any progress. Once a week at full intensity should be sufficient. How Often Do You Work Your Arms? Over Three Times A Week. With arm training it is imperative to get a good muscle burn and pump, to facilitate growth. In order to achieve this, excellent form must be maintained throughout the movement. With biceps curls, for example, there must be a full stretch at the bottom of the movement followed by a complete squeeze at the top. Needless to say, the movement should be performed in a controlled fashion. Too much weight might result in less emphasis being placed on the actual muscle, with more being placed on the joints and other supporting structures. Furthermore, excessive swinging of the weight might impede progress, and ultimately result in injury. Therefore, always use a weight that will allow between 6-12 perfect repetitions and always remember to stretch and squeeze. Consistency applies across the board in bodybuilding, whether it is diet, training, rest, or mental attitude. In fact, without long-term dedication to a realistic and successful training framework, results will be marginal at best. With arm training, it is important to have a solid plan of attack right from the outset. Layoffs and periodic back-offs from intensity will probably not cut it, if complete, massive, arm development is desired. Give arm training your all, and follow the advice given in this article, on a regular basis and watch your arms develop to their potential.